Major rail station in South London. Travelcard zone 2. Services to Waterloo, Victoria, and East Croydon. Also the southern terminus for West London Line trains, and one of the termini of the East London Line. The station is claimed to be the busiest in Europe in terms of the number of trains that pass through. Most Waterloo-bound trains from parts of Hampshire, Berkshire, Surrey and Sussex stop here, and most Victoria-bound trains from parts of Surrey, Hampshire and Sussex stop here. The consequence of this huge amount of traffic is that the station is the main place for changing trains and is very crowded at commuting times. Platforms 5, 6, 10 and 12 in the morning, and platforms 11, 13 and 15 in the evening get especially congested. --Rowley Birkin QC, November 2007. 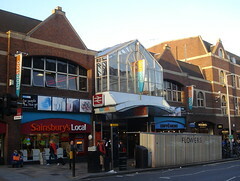 The main entrance, on St John's Hill at the south end of the station, is home to a small shopping centre which lies just outside the ticket barrier. There's a small Sainsbury's, an M&S Simply Food, a Costa Coffee, a Caffe Nero, a West Cornwall Pasty Company stall, a small WH Smith's, and a small newspaper/magazine outlet. As of January 2008, there are plans to redevelop this part of the station. Toilets (20p coin needed) are in the main walkway under the platforms (i.e. inside the ticket barrier). Many other coffee places and small shops are dotted around the station. On the Kingston Loop Line. Info on facilities last verified by Rowley Birkin QC, November 2007. Last edited 2014-11-08 12:18:51 (version 14; diff). List all versions. Page last edited 2014-11-08 12:18:51 (version 14).